Our pool is about 12 years old and came with the house we recently purchased. The pump is a Jacuzzi Magnum Force 1.5 hp with an AO Smith Motor. It's loud to the point my neighbor has commented about it. The best way I could describe the noise is that it sounds like a coffee can rolling around that's filled with pennies. Before I discovered TFP and decided to take control of my own pool, I've had a couple of different pool 'guys' come out. Their advice seems to have been honest. They both told me that unless I really want to spend the money on a whole new pump/motor, that I should just try and live with the noise until the motor gives out. They said that if I try to remove the motor to repair or replace it, that I might need parts to reattach it to the pump unit that are no longer available. Seems to me that they believed thatwhatever part they were talking about would likely be unusable once I took everything apart. Since I'm really not familiar with these things, I'm not exactly sure what part(s) they were talking about. Also, I told my local pool store guy about my noisy pump and he told me just to bring the pump motor in and he could probably fix it. Something about changing some bearings or something for like $15??? He said all I had to do was remove the motor and impellar or something like that. I really don't recall exactly what he said but he said it was a real easy fix. Nonetheless, I'm reluctant to even try to remove my motor b/c I'm fearful that once I take it apart that I won't be able to put it back together the way it was. It already has a very slow/mild constant leak which I'm also told is nothing to worry about as it never accumulates enough water to even form a puddle - The concrete slab around the pump/motor housing just tends to be wet most of the time. So my dilema is if I should even bother trying to disassemble the motor in hopes that I can bring it in and have it fixed/serviced/whatever or if I should wait until the motor dies at which point I will have to replace everything. I realize my other option is to simply replace everything now which I'm trying to avoid due to financial reasons. Motor and seal set time. I wish I understood what you were trying to say. I'm wondering if these are the parts the pool guys were talking about that would likely need replacing once I remove the motor from the pump. Do you think that ordering this 'go kit' would be my best bet and cover me for the parts that I'm most likely to encounter a problem with? If there's a serious financial concern I'd just wait till it quits completely then have it rebuilt. Of course it's better to rebuild it before it actually quits but that's your call. Here's what I'd do if I were you. I'd take the entire pump out and take it to the guy that said he would replace the bearings and have him replace the seals and o-rings listed in the kit above. My financial concern is only that I'd MUCh rather avoid having to replace the pump if I have to. I'm only modestly mechanically inclined. I can do a lot of things but it helps me most when I've seen it done before. Having never disassembled a pump/motor, I'm a little reluctant - but I'm willing to take a stab at it if the risk of problems is minimal. Would it be significantly less work to simply remove the motor from the pump and bring that in? I know I said I was reluctant to attempt this but I'd rather not disturb any of the piping connections the way they are now. If removing the motor is easier than I'm expecting, maybe I'll just give it a try. I guess I'm just looking for a little encouragement :? If I understand things correctly with my pump/motor, I'm supposed to turn the ring (mounting nut) where the motor is connected to the pump to the left (indicated by blue arrow). Then, I would have to remove the screws that are indicated with the red arrows (There are 2 others below). The easy part would be removing the large outer ring. However, the 4 screws are another story. When I look closely, the heads of the screws appear to be corroded with no discernable screw head. I don't think that I'll actually be able to get this thing unscrewed. Am I understanding how to take this thing apart correctly? The easiest thing to do is take the wet end (part that houses the impeller) apart and take the whole thing in. If it's just a matter of rotating the housing indicated by the blue arrow it's really simple. The bolts indicated by the red arrows are bolted from the inside the housing and will become accessible after disassembling the wet end. The bearings that I keep hearing/reading that may need to be replaced... Is that a part that's included with a motor, or is that inside the pump? I'd hate to buy a new motor and then find out that I just needed to replace a part that wasn't even part of the motor. The noise you described are the bearings in the motor that hold the motor shaft straight and true. While rebuilding the motor is possible and usually less expensive, I have found that buying and installing a new motor will outlast a rebuilt. A Go-Kit will not quiet the motor but if/when you change/rebuild the motor, a Go-Kit is a good way to help prevent leaks and ensure like new performance. 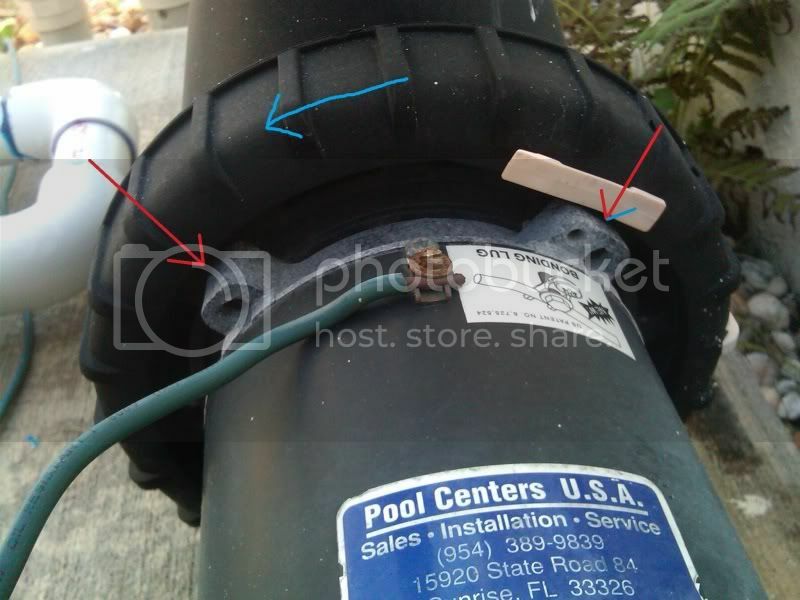 How to change spa air blower to jet like the jacuzzi? Help me choose a vs pump. Jacuzzi, Pentair, Speck/Aqua technix, or Hayward?